sdwdate-gui currently is effectively unused in Qubes. It is installed by default, can be manually started and works. However cannot be automatically started, since that would be a usability mess. One systray icon just for sdwdate per VM. So for most users at least two, for gateway and workstation. And and additional one for any additional workstation. The only instance of sdwdate-gui in Qubes should run inside Whonix-Gateway. Any Whonix-Workstation that boots should register itself automatically inside Whonix-Gateway's sdwdate-gui. Then notify Whonix-Gateway about its status. And on shutdown, de-register from Whonix-Gateway. In case of Whonix-Gateway reboot, it would have to ask all currently connected Whonix-Workstations to re-register and to relay their current status. Whonix-Gateway and all Whonix-Workstations would result in new sdwdate-gui systray icon sub menus. It should be possible to securely implement this communication protocol using Qubes qrexec. A green, yellow or red systray symbol is shown depending on the state. The new implementation for Non-Qubes-Whonix should look the same as currently is in Non-Qubes-Whonix. There probably should be a command line switch for sdwdate-gui's two different modes? Or should there be better two different Non-Qubes-Whonix sdwdate-gui and Qubes-Whonix sdwdate-gui? Whatever makes more sense code maintenance wise. I guess a new tool /usr/bin/sdwdate-gui-qubes would make more sense than trying to share code in /usr/bin/sdwdate-gui? Probably no separate package required. (Package sdwdate-gui-qubes not requried.) Just add to sdwdate-gui (and modify sdwdate for qrexec). There could be theoretically an "infinite" (large) amount of Whonix-Workstations booting up. When a Whonix-Workstation boots up, it issues an qrexec call to Whonix-Gateway to register itself so it gets added to Whonix-Gateway's sdwdate-gui systray. What if Whonix-Workstation is shut down, killed ungracefully, or crashed? Then it cannot deregister itself. How does Whonix-Gateway's sdwdate-gui systray notice and remove it? Any idea? Should Whonix-Gateway "ping" the Whonix-Workstations every X seconds? And if they don't answer, remove them from the menu? What if Whonix-Workstations just hang and come back later? The case has to be covered if a Whonix-Workstation sends a updated sdwdate status which was not previously registered. Whonix-Gateway has its own sdwdate-gui status. This explanation is a bit redundant. Since quite hard to say for me in English, I rephrase the same various times. If gateway is in status "red" -> use red color. If gateway is in status "yellow" -> use yellow color. If any of the workstations is in status "red" -> use red color. If any of the workstations is in status "yellow" -> use red color. If there are mixed statuses (one workstation green, another one yellow, another one red), use the worst status. Red is the worst status, yellow is better, green is best. Yellow has always priority over green. Show only green if Whonix-Gateway and all Whonix-Workstations (if any) are green. Each entry in sdwdate-gui should show the name of the Whonix-Workstation (qubesdb-read /name) and an icon showing its status. Once hovering over a menu point such as "anon-whonix", open a sub menu showing the same as the old right click menu? Please keep in mind, that in a later version we might extend the functionality of sdwdate-gui to a Tor controller. Similar to what Vidalia did in past (but much more lightweight, less features). A tool that would also show the state of Tor connectivity. Probably not before Whonix 15 or 16. Does that sound like sane usability? Do we have any access to any usability designer? @marmarek is there some qubesdb-read to find out from anon-whonix that its NetVM is sys-whonix? Currently there isn't, but can be easily added, even as a stable update to Qubes 3.2. A problem with this approach - needs to be manually synchronized when configuring multiple Whonix-Gateways. On the other hand, some policy for this qrexec will be needed anyway. Am I correct saying that the default anon-whonix created during installation of Qubes 4.0 contains a tag anon-vm (like Whonix templates containing whonix-updatevm)? When creating a second Whonix workstation, only the default created-by-dom0 tag is listed. Add tag anon-vm for newly created workstations. It looks fine, but we still need to manually add a tag for each newly created anon-vm. Would there be a way to automate the process ? The new GUI is partially done (no icons for the reasons below). The anon-vm list is updated in the menu as they start. Show status is implemented, showing the last -partial- message for the corresponding vm in the gui popup. No status tooltip, only a general one. For now, the qrexec commands are issued from the workstations sdwdate-gui, for practical reasons, the main one being that it's easy to restart sdwdate from there. Use the yaml key instead of the message in its entirety (a big change in sdwdate), or perhaps use a file argument as per https://www.qubes-os.org/doc/qrexec3/#qubes-rpc-example---with-argument-usage. It would probably require a two-way communication, which anyhow will be needed at some stage . Or whatever you might suggest. that was to help with ease of development, debugging, code cleanness. between the both? Just brainstorming. Whatever you think works best. They are some issues regarding the format of the argument in qrexec-client-vm sys-whonix whonix.test+"[argument]" when it reaches the target vm. It's sanitized, no problem there, it can be parsed, but it's truncated at 51 bytes, which limits what we can pass. (Qubes secure copy and paste is based on qrexec). > > @marmarek is there some `qubesdb-read` to find out from `anon-whonix` that its NetVM is `sys-whonix`? > Currently there isn't, but can be easily added, even as a stable update to Qubes 3.2. You can send the message inside the connection. argument is really useful when you want to setup qrexec policy based on its value (like allow some messages but not others). If you just want to send a message, pipe it to service stdin on one side, and receive from stdout on the other. Working on it. Right now you can use some placeholder ($default in R4.0) and redirect it to appropriate VM in qrexec policy. Downside of this solution - you need to keep qrexec policy in sync with netvm setting manually. As for qubesdb - I'm considering /qubes-netvm or /qubes-netvm-name for that. But I have a problem: we already use various /qubes-netvm-* for settings inside of netvm (like what network range should be provided to other VMs). Not for information about VM's uplink. Any better idea for the entry name? That's what I was thinking of when starting. The tool would be a subset of sdwdate-gui. At the moment I'm using sdwdate-gui "as is" plus the qrexec command. I'll try to describe the current setup (working). in anon-whonix external tool: if is_qubes and is_anon_vm and I have a new sdwdate status --> "qrexec sys-whonix new-status-rpc(my name)"
in sys-whonix, new-status-rpc writes the calling vm name to a file: "echo $1 >new-status-file"
in anon-whonix, the script sdwdate-status-rpc: "cat /var/run/sdwdate/status"
in sys-whonix, sdwdate-gui watches new-status-file. On change --> "qrexec vm-name sdwdate-status-rpc > status-file". Then pickle.load status-file and the following logic is common with sys-whonix status_changed. Hope this is clear enough. It's almost easier to write the code than to describe it. This way, we leave sdwdate untouched. Yes, the code in sdwdate-gui-qubes has a lot of additions and cannot be adapted to non-qubes environments. So we could have an additional module in the same package. It would be up to you installing the right one. Perhaps /qubes-gateway or /qubes-gateway-name. I'm using a tag gateway for the policies in dom0. It would be consistent with Whonix. As a reminder, the Whonix-Workstation are registered as they start. In the systray menu, the icon besides the workstation name is the one from sdwdate status. Now, we have to update the systray icon to reflect the worst case in the running workstations. As the icons are passed by path/name, it's not easy to sort, unless we reproduce the icons names in sdwdate-gui. The icons path could be in sdwdate-gui (logically they belong there), and the icon level would be passed from sdwdate as a number ( 0 = success, 1 = restricted, 2 = error). What happens if a workstation is killed, and then later restarted? Any other cases where any (delayed) re(starts) corner cases could lead to something strange? Like when the workstation sends sdwdate-gui info to the gateway before the gateway is ready or is that pretty unlikely? Passing which icon by passing a number through qrexec sounds very reasonable, yes, why not. Could a compromised workstation use this to execute code on the gateway? pickle load deserialize an object, in our case a DICTionary. Anything not in that form would raise an exception. Even if a dictionary element contained some code, it would be displayed as such (or raise an exception for the [icon] entry). The workstations gracefully notify the gateway when they shut down, thus being de-registered in sdwdate-gui-qubes, and re-registered whenever they restart. That is for normal shutdown-reboot-poweroff. If they are crashed/killed, the gateway has no way to know (yet). Any other cases where any (delayed) re(starts) corner cases could lead to something strange? Like when the workstation sends sdwdate-gui info to the gateway before the gateway is ready or is that pretty unlikely? That seems very unlikely in a normal start sequence (gateway booting before workstation). Anyhow, the setup being heavily tested during this phase, we'll see if I manage to defeat it. Thanks for the clarification. I was not sure. Will use json instead. BTW f.close() is unnecessary when using with syntax. The package should be complete on github. After installation, it is -probably- required to enable shutdown-notify systemd service in whonix-ws. What if NAME set nothing, i.e. NAME="". What would happen? By checking if exit code is non-zero. Also in case of a bug qubesdb-read /name might return "", i.e. nothing. I do not remember what Vidalia did exactly, never used it much. There was probably some circuit changing and other exotic features. To begin with a Tor controller, it looks feasible (with a dedicated submenu under sys-whonix menu entry) to run anon-connection-wizard and restart-tor-gui from the systray icon. Perhaps mostly external applications that get tied together in sdwdate-gui? Like a plugin structure (without inventing overkill)? I still remember it and found some representative Vidalia screenshots. world map - http://i1-mac.softpedia-static.com/screenshots/Vidalia_2.jpg - we probably don't need to reinvent (all) - we already install https://packages.debian.org/stretch/onioncircuits by default. Perhaps we let users run onioncircuits from it? I guess most importantly (and only?) (simple...): "Does Tor work or not? If not, what's the status? Any advice?" / "reconfigure using anon-connection-wizard". That would be a superb start, I guess. More complex stuff such as configuration of hidden services could be done later if ever. We could use some wider input such as from the tor-talk mailing list (what features would be useful for a Tor controller, Vidalia replacement) as well as from some usability designer. it: Once sdwdate-gui is also a Tor controller, we'd need to rename it? Any generic use case / generic name possible (i.e. not Whonix in its name)? Yes, the next step should be trying to get a comprehensive tor status with recommendations and perhaps some tor log in case of failure. The sdwdate-gui icon is updated according to Tor status. Which, before any other question, leads to the name sdwdate-gui vs ??. It will be a big change in the package, so before going farther, it would be nice to agree on a name. I'm not good on that matter. A bit lazy perhaps, Anon Controller would do the job if only because there is GUI with the existing tools in the pipeline. Some other people could have input. A couple of remarks about the current version. 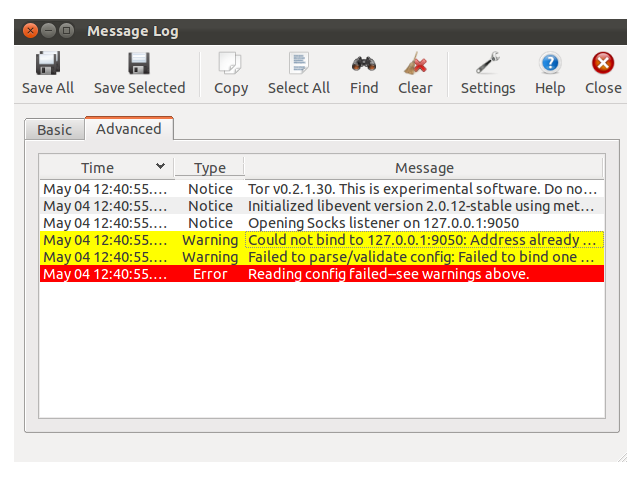 In sys-whonix, Tor status message GUI is shared with sdwdate message, meaning that when showing Tor status and restarting sdwdate (or it restarts by itself), the latter will pop (unless Tor is stopped or disabled) . Might be petty, but when used intensively, it can be annoying. I have already a dedicated show_tor_message that gets the status icon too. Wondering if it's worth implementing the logic for a separate popup. Second and more important, the precedence of Tor not running vs Tor disabled (DisableNetwork 1). When Tor is disabled, we might or we might not have an internet connection. Obviously, after setting Disable in Anon Connection Wizard, there is none because we stop Tor too. I guess this issue could be the subject of another (umpteenth) thread. The package is standalone, not depending on any other Whonix package, except anon-connection-wizard, which can be checked on loading. After the last update, the package can be run from sdwdate-gui menu. It's a tabbed application. Considering the number of options that might end up in there, I believe that it is the best layout. The opening tab is the one really needed by the user, showing Tor status and configuration, plus access to useful commands. It's far from being completed. Though it's running, there is most likely some debugging left. Before adding more feature and perhaps publishing some screenshots, would be nice to have you point of view. When putting sdwdate-gui-qubes under stress, I have been chasing a segmentation fault. It was due to a poorly written context menu. Fixed. sdwdate at a random time interval ranging from 1 to 2 minutes. It looks promising. It might be ready for testers shortly. I assume those VMs will locate each other some other mechanism, so anon-whonix will know to call to appropriate whonix gateway, even if user create custom one, right? Can you think of any mechanism suitable for that? I'm ok with that, unless you consider it a privacy issue. Patrick removed a project: Whonix 15.